The Park: Weather-worn Arches National Park contains over 2000 natural stone arches, hundreds of soaring spires, many massive fins and a bunch of balancing boulders, all which have been carved by natural elements over the past 200 million years. Delicate Arch, the 65-foot sandstone icon (pictured above) is one of the park system’s most widely recognized landmarks. Also known as “Chaps” due to its resemblance to a bowlegged cowboy, Delicate Arch began as a “fin” and over the years eroded to its present state. Landscape Arch (pictured below) is the other impressive landmark and yet I can’t help but think they got the names backward. Landscape Arch certainly appears much more “delicate” as it stretches its thin ribbon of rock across a 306 foot span! Getting there: Arches is located just outside the city of Moab in the eastern reaches of Utah. 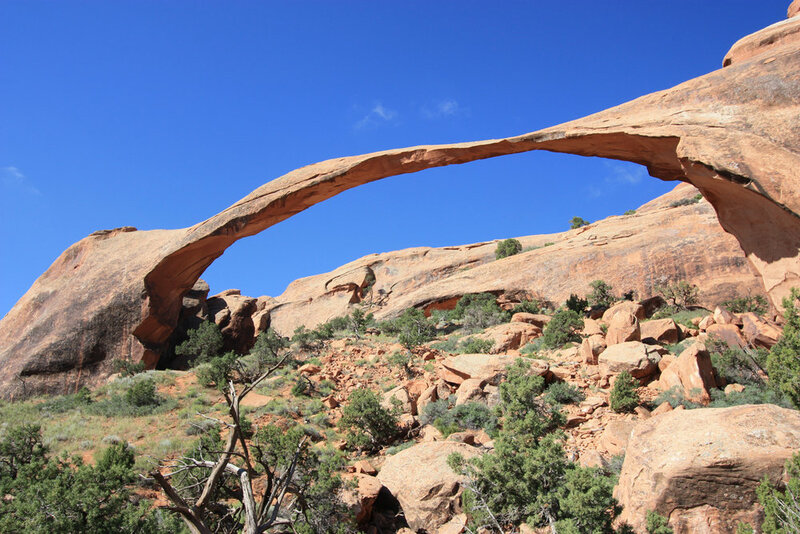 When to visit: Open year round, Arches is most pleasant in the spring and fall when temperatures are moderate. Summers can be very hot. The best hiking is during the spring and fall. What to do: Arches contains many nicely groomed trails for hikers of all abilities. Most are rated easy or moderate. 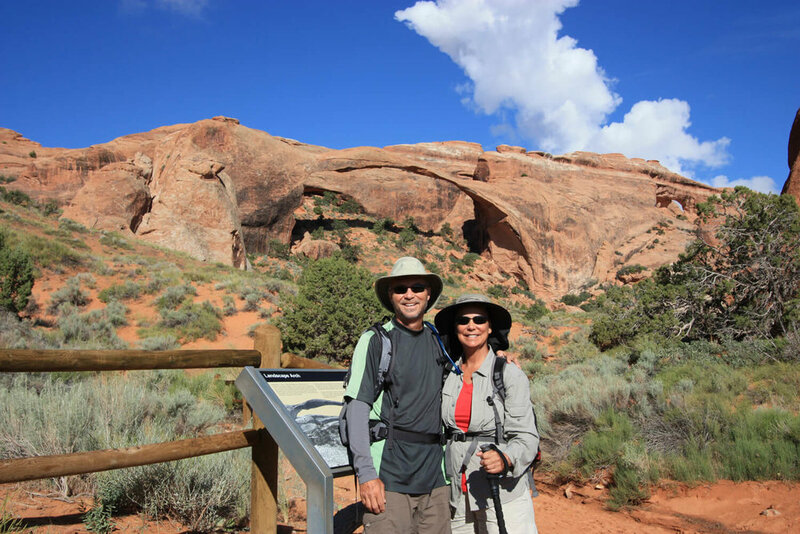 The 1.6-mile round trip hike out to Landscape Arch is rated easy. The 3-mile round trip out to Delicate Arch is a bit more challenging; however, these are two hikes you should not miss! The Fiery Furnace trail is rated strenuous. Sign up for a ranger-led hike and explore the labyrinth of narrow canyons while climbing over expansive slabs of sandstone. Hiking the Furnace on your own requires a permit. Scenic Drive: If hiking isn’t your thing or if you have limited time, be sure to take the Arches Scenic Drive, which takes you through the heart of the park. 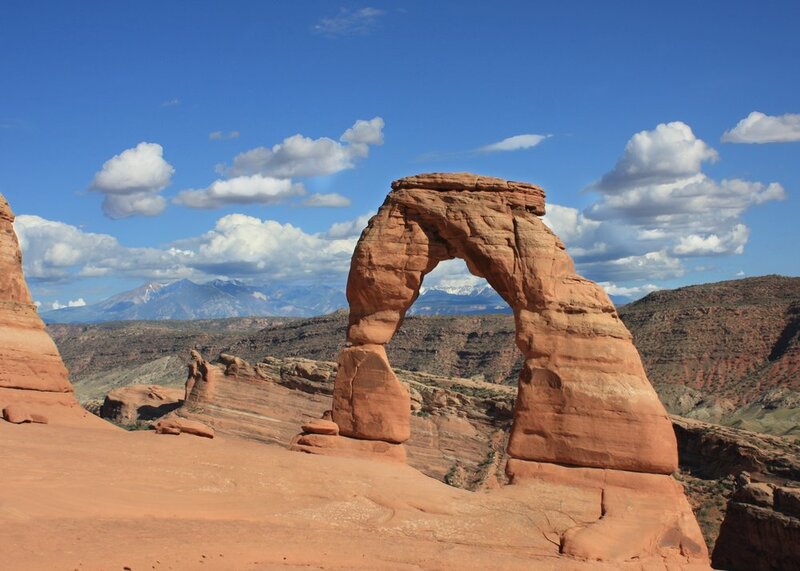 Two spurs off the main road will take you to Delicate Arch Viewpoint or The Windows Section of the park. However, to truly appreciate this park, you’ll need to get out of the car and walk about the grounds. Photo Ops: Arches is ideal for composing stunning pictures of the parks many compelling subjects. The warm light during sunrises and sunsets provides incredible lighting for the many subjects awaiting your camera. Where to stay: The City of Moab is just minutes from the Park entrance and offers several hotel and motel options. The Devils Garden Campground has 50 individual campsites and two group sites handling up to 55 campers. Trivia: Although most of the arches look “rock solid” and indestructible, eventually erosion will win out and gravity will take its toll as it did with Wall Arch on August 5, 2008. Memorable moment: When we began our hike out to Delicate Arch, we noticed three large busses in the parking lot. Hmmm. When we arrived at the Arch, we were shocked to see how many people were milling around the grounds! Trying to get a photograph of this iconic arch without a couple dozen people in the shot proved to require a great deal of patience! Patience paid off as the Bus Drivers eventually herded the masses back to parking lot! Fun reading: Edward Abby’s experiences as a park ranger in Arches in his book called Desert Solitaire. Banner: A lone wildflower amongst the arches and fins.